Hello Linux Geeksters. Nuvola Player is an application that allows the users to listen to music from the clound, having good integration with Linux. It integrates well with Unity, showing the currently playing song via notifications, has docking capabilities et cetera. It has support for a bunch of important music services, including: Google Music, Bandcamp, Deezer, Grooveshark, Hype Machine, 8tracks, Pandora, Rdio and Amazon Cloud Player. The latest version available is Nuvola Player 2.4.1, which has been recently released, coming only with bug-fixes for the already known issues. 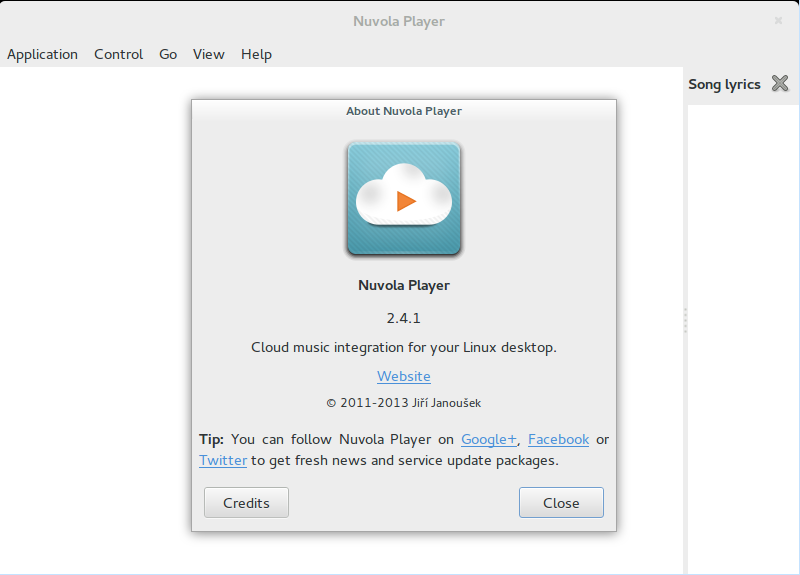 In this article I will show you how to install Nuvola Player 2.4.1 on Ubuntu 14.04 Trusty Tahr, Ubuntu 13.10 Saucy Salamander, Ubuntu 12.04 Precise Pangolin, Linux Mint 17 Qiana, Linux Mint 16 Petra, Linux Mint 13 Maya, Pinguy OS 14.04, Pinguy OS 12.04, Elementary OS 0.3 Freya, Elementary OS 0.2 Luna, LXLE 14.04, Linux Lite 2.0, Peppermint Five, Debian Wheezy, Debian Sid, Debian Jessie and their derivative systems. To install Nuvola Player 2.4.1 on Debian, we have to use the Nuvola Official repository update the system and install the nuvola player package. Follow the instructions for your system exactly, in order to get a successful installation.